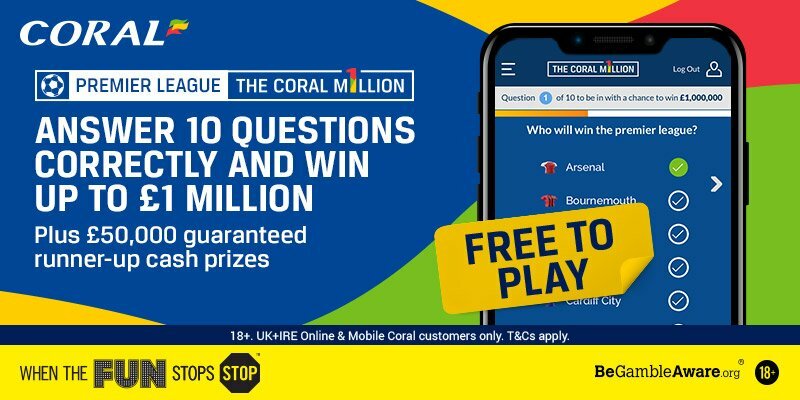 The Coral Million is completely free to play Premier League competition for Coral account holders (including customers who register via this page) that gives you the chance to win £1 million pounds! You just need to answer 10 questions correctly! Find here our Coral Million betting tips! Copy our answers and win £1,000,000! Coral have kicked off their Premier League build up with an exciting new competition. The Coral Million is a free prediction game! The questions have no right and wrong answer as they're all about predictions. The odds of getting all the predictions correct is quite high. Only the first question is a straight "yes" or "no". All the others have multiple options. You can find the best 10 Coral Million answers at the bottom of this page! Make your prediction for the ten questions Coral have asked. Login or create a new Coral account to enter the competition. Get all the answers correct and you're in with a chance of winning the top prize of £1,000,000. As mentioned it’s free to enter and runs until 23.59 UK time on 1st September 2018. To help you decide how to answer Coral have provided some useful stats. Plus, you can read our Premier League predictions here! Once you've answered all the questions you then need to register/login. You cannot change your selections after you've completed the entry. 18+. UK+IRE online and mobile verified Coral customers only. £1 Million represents total prize fund. Full T&Cs apply. So here are the questions and all our 10 answers! 1. Who will win the Premier League? MAN CITY is the safest option. Few teams have dominated the Premier League in the manner that the Citizens did last season. They finished 19 points clear of second placed Man UTD and also broke a number of records, including most points, most goals and the longest-ever winning streak. Pep Guardiola's team is simply too far ahead of the rest of the pack coming into the new season and is our Premier League Outright Winner pick. 2. Which two of 'The Top Six' will finish lowest? MANCHESTER UTD and CHELSEA are our answers. The Red Devils under-performed this summer and the situation at Old Trafford is becoming increasingly tense. Chelsea begin new life under experienced Italian manager Maurizio Sarri, who took over from Antonio Conte on July and it will take several month before the players will understand Sarri's style of play. 3. Will previous Champions Leicester finish in the bottom half? Leicester finished 9th last term. Without Riyad Mahrez the chance to see the Foxes in the bottom half of the table have dramatically increased. Our answer is YES! 4. Who will finish bottom of the Premier League? CARDIFF came out of nowhere last season to secure automatic promotion against all the odds after finishind 12th the season before. The Bluebirds are the 7/10 favourites to be relegated and the bookmakers have every reason to believe the will struggle this term. Cardiff have the weakest team in the Premier League on paper and have failed to make significant signings this summer. 5. Who will win the Premier League Golden Boot? PIERRE-EMERICK AUBAMEYANG had five months to settle into the Arsenal last season and scored 10 goals in 12 matches. We expect his goal average to dramatically improve this term as Gunners' manager Unai Emery will play attacking football. The Gabon striker is our Premier League Top Goalscorer Pick! 6. How many members of the victorious French squad will score a Premier League goal this season? Very tough. Paul Pogba, Olivier Giroud, N’Golo Kante, Benjamin Mendy and Hugo Lloris are the current world champions playing for a Premier League team. Among them, Mendy and Lloris have very few chances to find the back of the net while Pogba could join Barcelona. Anyway, the transfer market (also in January) could see more French champions move to England (Nabil Fekir is the most probable). Hence, our answer is FOUR! 7. How many managers will permanently leave their position between August 10th and Christmas Day? Even tougher. Let's take a look at the stats. The range of sacked managers before Christmas go from one (back in 2011) to nine (in 2014). Last year we saw 4 sacked managers between August 10th and December 25th. Neil Warnock and Mark Hughes are obvious choice, while Josè Mourinho and Rafa Benitez are clearly unhappy with the transfer market and could be sacket by their respective board. One or two more struggling teams could add their manager to the sacked list. Hence, we answer FOUR-FIVE! North London Derbies have a 0.21 red card average in Premier League, 0.19 for Manchester Derbies and 0.40 for Merseyside Derbies. Summing up, we have a total of 0.80. Hence, our answer is ONE! 9. Who will win the PFA Players' Player of the Year? Another very tricky one. Man City dominated last year's tournament but Mo Salah won the Player of the Year award after a record-breaking season. This year we believe a Citizens' player could be a smart choice. RAHEEM STERLING is our answer. 10. How many clean sheets will there be on the final day of the season? Final days of the season usually see a lot of high-scoring games. Anyway, last year six teams failed to find the back of the net, the most since 2014/15. This season we expect FOUR teams keeping a clean sheet on final day. So that’s all 10 answers – get your entries in before the Premier League starts and we wish you all the luck in the world. If you use some of our suggestions and win the big million quid, feel free to share some of it! "Coral Million Answers: Our Tips to Win £1 Million with the Premier League"